Whitetail Poet was born while bow hunting the remote tracts of Northern Minnesota. Our goal is to tell the back country narrative through script and image, unlock your story, and pass along some of our gathered craft as well. Thank you for taking time to learn about us. Let me introduce you to our team. 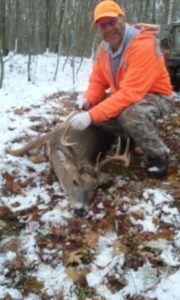 Hello, my name is David Bakke, and I am the founder of Whitetail Poet. I am very thankful for my wife, friends, and fellow contributors, who have supported, and generously given to the concept of Whitetail Poet. I married the love of my life, and just celebrated thirty-four years together. We raised our two children in a small farm town nestled between the lakes and open prairie in west central Minnesota. I grew up in the lake country just east of our present home and have loved the outdoors my entire life. As a boy, and teenager, I spent hours exploring the local woods at our Round Lake cabin and cruising the waterways in a two-man Folbot Kayak along with a Lund fishing boat equipped with a reliable Johnson outboard motor. The Pelican River behind our house in Detroit Lakes became a place of adventure when I was not at our cottage as well. At the age of twenty, deep in a hard-core drug life-style, I was introduced to the transforming power of Jesus Christ, and deer hunting. Both influenced my life in a great way. I have followed my faith into a lifetime of youth, pastoral, music, and rural ministry in the upper mid-west and Canada. In my hunting journey, I progressed from a party hunter, to a still hunter, and now enjoy the solitude of the solo chase with my bow from eye level as a ground hunter, using natural cover for the majority of my Whitetail pursuits. I am a sign painter by trade, and employ old school hand lettering and sign art techniques. I perform original music on my guitar, and keep fit through the Korean martial art of Taekwondo. I have almost completed a Communication Arts/Literature, English Education degree, from Minnesota State University Moorhead, with a goal to teach English Language Arts in our rural area. In my first High School creative writing class I discovered the enjoyment and satisfaction of putting pen to paper. Now, years later, I am privileged to be moving my career into the field of writing and literature. Hi, my name is Matt Bernier. I’m a very lucky man. I am married to my amazing wife, and we have two beautiful kids together! I am an avid woodworker, graphic artist, percussionist, bow-hunter, and martial artist. I love my family, and I am an all-around outdoorsy fella. I am also a wild-land firefighter and worshiper of Jesus! The love of woodworking bit me hard in the sixth grade during shop class. I was fascinated by how a piece of wood could be transformed with a little imagination. I enjoyed working with power tools, and I was drawn to woodworking even more by the simplicity of the time honored hand tools. This passion is what compelled me to create, build, refinish, and craft, a wide variety of projects which ranged in material from newly felled timber, to old barn wood. Getting to see the finished project is great, but the process of creating, is much greater. One of my woodworking goals is to craft hand-made archery bows. Graphic design is a skill I have developed over the past ten years, and I was excited to render the artwork for Whitetail Poet, and see the idea take form and grow. Regardless of the medium; logo design, websites, tee-shirts, or furniture, I thrive on the creative process, and I am thankful for the ability to be a part of the artistic community. I started my love for the outdoors as a kid, going on adventures at the lake, building forts, and playing army in the woods. My dad took me on my first hunting trip when I was a teenager in North Dakota. That is what really set my love of hunting in motion. Now, I spend as much time outdoors as possible, hiking, paddling, hunting, working, or just chilling out with my wife and kids. Being a wild-land firefighter, or smoke chaser, as we are called, is a truly great job! Spending time patrolling the big woods of northern Minnesota, clearing trees, and when the sparks fly, heading to the fires, is an adrenaline rush like nothing I have experienced. It is a lot of fun! Studying old style Okinawa Karate is more of a life style then a work-out routine for me. Karate has become part of my everyday life. My martial arts training started around age five and included the Korean striking art of Taekwondo. I was fortunate to meet my current teacher, Mr. Michael Cline, and his instructor, Mr. Taika Oyata, the founder of our fighting style, when I was a young man. I have been training old style karate for twenty years now and never plan to stop! All of this is nothing without the one I do it for, my Savior and friend, Jesus. He has gotten me through many hardships which I would not have survived without His love, mercy, and guidance. It is an honor and privilege to worship my God, spend time in the crafts, and His beautiful creation; the greatest church a person could go to! Whether it’s time with my family, sitting on a log with my bow, building, or training, my desire is to walk in God’s peace and presence. Hey all, my name is Joas Miller. I grew up with a family of eight children in a small Amish community tucked up in the hills of northwest Montana. Money was in short supply during those years, so from my earliest recollection, out of sheer necessity, I remember all of my siblings hunting to help put meat on the table. Naturally, this put a desire in me to follow their footsteps. Being the youngest of our family, with my first BB gun I earned while working for my Father in his log home building trade, I started my hunting career at the age of nine chasing gophers and squirrels. I diligently collected their tails and skins, and developed a love for the outdoors as I wandered through the draws and rises which surrounded our wilderness home. Today, I continue my legacy of hunting, along with the tradition of log home building in the mountains of Montana with our family business. Along the way, I enjoy trying to capture the beauty of the wilds through the eye of my camera’s lens. 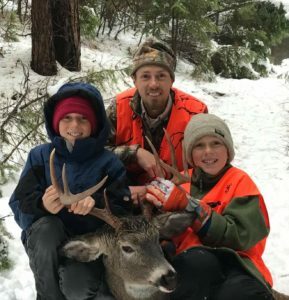 My wife has harvested deer, and antelope, and my oldest twin boys who are eleven years old, have each taken a doe, and bucks, as well as turkeys, and small game. My smaller children watch with wondering eyes, knowing that they too, will one day tramp through the back-country with Mom, Dad, and their older brothers, in pursuit of the majestic Elk, elusive Whitetail, and smaller, weary, forest dwellers. Being outdoors, in the solitude of the mountains hunting, fishing, hiking, mountain climbing, building, or sitting around a simple campfire with the ones I care about, carries for me, a peace which I am unable to find anywhere else in this life. It is there, in the beauty of creation which surrounds me, that I am able to hear the still, small voice, of my Creator.